In March 2012, then President Pratibha Patil presented the Sixth National Grassroots Innovation Awards to 47 innovators of India. Among the top three honorees was Mr Gurmail Singh Dhonsi of Ganganagar, Rajasthan, winner of the National First Award. 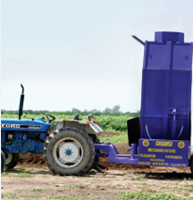 Rapid Compost Aerator and Tractor Mounted Tree Pruner, innovations that fetched him the national recognition, are prime examples of what drives Dhonsi. The compost aerator, in fact, was a follow up of the tree pruner. It was a remark by Surender Kumar Jakhad of Maujgarh, a Punjab village bordering Rajasthan, that set him thinking. Says Dhonsi, "Jakhad said why don't I make a machine for him that could use all the leaves and fruits wasted in pruning?" That was the lead for Dhonsi to start drawing for his next invention. It was Jakhad, again, who inspired Dhonsi to develop his award winning tree pruner. A tractor mounted device, the pruner draws upon the tractor's hydraulic system to power its motor and operate the blades. The beauty of the simple device is that it can be mounted on any tractor of 40 hp and above. It can prune trees of up to 20 ft height; in about one hour it can prune and dress 200 trees consuming just 3.5 litres of fuel. The tree pruner is a cost, time and fuel-efficient innovation that can revolutionise farm production in orchards and horticulture gardens. NIF has filed a patent for the pruner which is priced at US$ 8550. This 53-year-old inveterate innovator is not ready to hang up his boots yet. He is currently in the process of perfecting a ridge-maker. There are other machines on his agenda—all of them inspired by the grassroots problems of farmers and aimed at easing their workload. He wishes to produce these on a large scale for economy of scale benefits and hopes for subsidies on raw material for himself and for farmers on finished goods. "If farmers get subsidy, it will be good," he says. Given Dhonsi's sincere pursuits, more inventions are sure to come out of his 'workshop'.